Back in June 2010, I reviewed my first LED flashlight on ModSynergy and the Dorcy flashlight got me hooked on LED flashlights as a hobby. Since then I've been intrigued with the world of flashlights. Flashlights have come a long way from incandescent models that are taxing on batteries and not as bright to the new high power LED variants that are much more powerful and also capable of being powered by a single AA battery you can pick up just about anywhere. The flashlight is without a doubt one of the most invaluable tools ever invented. This hand-held battery powered light source comes in various shapes and sizes and can provide important lighting in emergency situations such as search and rescue, home power outages, in leisure settings such as camping, hunting and much more. 'Light-emitting diodes' or LED has just about every benefit over incandescent lighting technology possible. Whereas incandescent light bulbs generate lots of heat, LEDs are the opposite. Incandescent lights soak up lots of energy (from batteries for example) while LEDs do not, resulting in longer run times. Also, incandescent light bulbs have a much lower lifespan than their LED counterparts. That is why you would have to replace the incandescent bulb than you would on an LED flashlight. In fact, on an LED flashlight, you'll likely never have to replace the LED, because they are either soldered on the board or they last a very long time (anywhere from 25,000 to 50,000 hours). You probably still have old electronic devices (1970-1980's) that use LED's and they are still working today (I have quite a few). Not every flashlight are made the same and the components such as the LED and reflector inside are the things that matter. The Nitecore model I am reviewing today features innovation in the form of the Smart PD system in the D10sp R2. The Smart Piston Drive system is an all in one mechanism innovated by Nitecore that replaces the normal separate clicky switch on normal conventional flashlights. Piston Drive (PD) design makes the light more compact than lights with traditional clicky switches. It houses the battery in the same piston, along with the button to allow switching from low to full power with a simple press of the piston. The Smart PD system allows the form factor to be more compact than lights with traditional clicky switches, because there is less separate parts. Flashlights come in a variety of sizes and shapes, but not many of them are practical for every day usage. Today I am reviewing a flashlight that looks to fill in that mould and be a practical flashlight that you can carry and use anywhere. The flashlight falls into the EDC (Every Day Carry) category and we'll see if the Nitecore D10sp R2 is worth your money. The Nitecore D10sp R2 is powered by a single AA battery, and is user programable to suit your exact lighting requirements. The unique smart piston drive does away with conventional click switches, and makes this flashlight stand apart from other AA torches on the market. Replace battery once it’s low to avoid battery leaks that may damage the light. Remove battery from the flashlight if it is not going to be used in short term period. Regularly lubricate the o-rings to prevent erosion and for better sealed against water. Replace the o-rings if they are damaged or wore out due to extended use. Periodically clean the threads or electrical contacts, to avoid possible issues of light flickering or not turning on. Below are some possibilities which may cause the light to flicker or not to turn on, we have corresponding solutions as well. 1, The battery is used up ---- Users need only replace with a fresh battery, please make sure you put the positiveend toward LED assembly. 2, The contacts like thereads are dirty ---- Clean the threads and contact points with a clean cloth and apply thin coat of silicon-based lubricant to threads. 3, Certain flashlight parts are loose ---- Please try lubricant the o-rings and screw the light tight. If the above do not help, please contact local dealer / distributor for warranty service. The Nitecore D10sp R2 comes in a compact corrugugated box with and orange and black color scheme. In the front of the box there is a holographic strip that has the Nitecore logo embedded, and a small plastic window that shows the actual product. You can see that the flashlight is indeed very small in size. Opening up the package, there is a cardboard piece that products the contents of the box. You have a Nitecore warranty card that sits at the top of the bundled contents. The instruction manual that came with this LED flashlight is all in Chinese, which wasn't really a help. I love the fact that the Nitecore D10sp has a wrist strap as this really is an invaluable tool to have on a flashlight especially for something as small as the Nitecore D10sp. It prevents any damages from any possible falls. I also like the metal pocket clip that is already pre-assembled on the flashlight, it too has proven useful as I can insert the flashlight into my breast pocket or breast pocket without incident and it is concealed, because of the way the clip faces. Unfortunately, with the direction the metal pocket clip is facing, you can't insert it on your baseball cap and have it act as a headlamp, the pocket clip faces the incorrect way to do that. The Nitecore D10sp measures roughly around 45.8g in weight, and 89.7mm x 20.7mm (LxW) in dimension. It fits in the palm of your hand, and will fit inside spaces with ease. The Nitecore D10sp is only a little bigger than a double AA battery. About the only thing missing from this bundle is a holster for the flashlight when it comes time to travel, but it's no big deal because this is an everyday carry. The Nitecore D10sp R2 contains a CREE XP-E R2 which allows a theoretical maximum output of 130-lumens. Consider our last few LED flashlight reviews have been around 145-700-lumens, depending on the battery configuration used, I believe 130-lumens in this small of a form factor, using a single 1.5v AA battery is quite enough to get the job done. Most people will elect to use standard AA batteries and this flashlight is something worth considering for those who are seeking an AA LED flashlight. 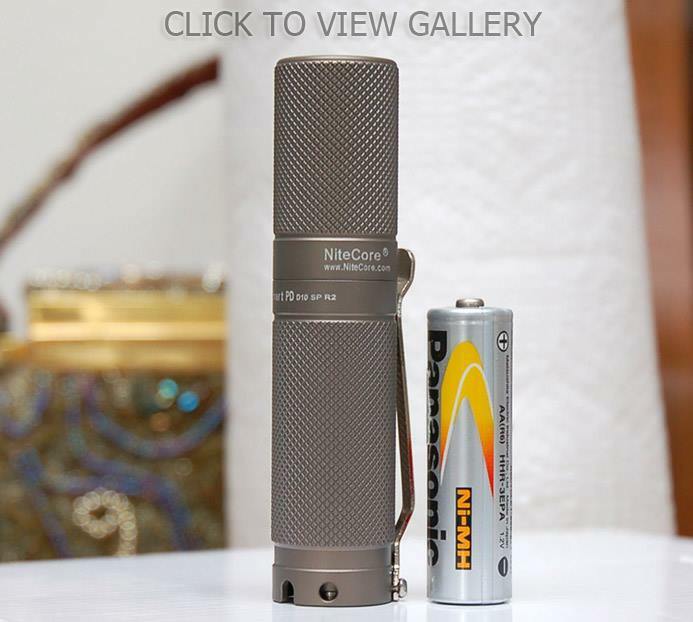 It's funny how literally tiny this thing looks compared to the Dorcy 220-lumen rechargeable flashlight I reviewed a while back. Compared to the JETBeam JET I PRO (V3) R2 LED flashlight I reviewed previously, the Nitecore ends up being 15-lumens less bright but with the Smart Piston Drive on Nitecore, it measures in even smaller. The Nitecore D10sp R2 is made from military grade aluminum alloy, meaning that its extremely strong being able to withstand more scenarios than most people will ever put their flashlights through, and also contains military-spec Type III hard anodized finished on the body. In addition, the Nitecore D10sp R2 has impact resistance by dropping that conforms to the US MIL-STD-810F specifications, which means the Nitecore has been treated and subjected to environmental and climatic conditions such as altitude testing, exposure to low and high temperatures, shock testing, rain exposure, and vibration testing to ensure full durability. It also helps that the D10sp R2 is waterproof to IPX-8 standards which means this flashlight is protected against water submersion beyond 1m. I'm actually not sure about the color, but the Nitecore D10sp R2 comes in some sort of light brown color, almost like sand. It certain lighting conditions it may come off as dark or lighter in complexion. Once you've experienced such an aluminum constructed flashlight such as this one, you'll never want to go back to plastic. Not only will aluminum perform better on impact, it acts like a heatsink and will be better for heat distribution and dissipation, whereas plastic flashlights would trap heat in the flashlight and not be as tough. Disadvantages would be under cold weather, the aluminum exterior gets very cold quickly. On the body of the flashlight, Nitecore decides to apply knurling (diamond cross pattern) below and above the Nitecore logo. This is a great idea as it has allowed the flashlight to provide better grip for the users hand and it prevents greasy fingerprints from being showcased (cuts down the fingerprints to a minimum. And I can tell you first hand that the execution is spot on, this type of knurling really helps and is not just for aesthetic purposes. The Nitecore D10sp R2 has smooth design philosophy. It basically conforms to the shape of an AA battery. The flashlight can roll off tables because it's just a cylinder, however, the pre-assembled metal pocket clip that is on the flashlight prevents that from happening once it reaches the metal pocket clip. One of the neat things about this Nitecore D10sp R2 flashlight is that it can 'tailstand'. Tailstand meaning you can stand it up and have it illuminate the room you are currently in (or even downwards in a camping tent--using the wrist strap). Some flashlights do not have this ability and it's really a great attribute for all flashlights to have. The flashlight can be taken apart into 2-pieces; you have the lower portion that also houses the Smart Piston Drive mechanism (holds the battery and acts as the switch) and the top piece that houses the LED, its emitter, reflector and lens. You do not have access to the emitter and or lens reflector, at least I haven't found out a way to do so. The flashlight comes pre-lubricated from the factory as evidenced from the photos. Lubrication on the threads is important in such flashlights to provide a clean and easy fit, and good seal for the rubber gaskets, and also in this case, lubrication is also needed for the Smart Piston Drive exterior. There are two rubber gaskets on this flashlight and they are pretty thick ones to be honest. Having such gaskets on this flashlight means the Nitecore D10sp R2 is waterproof according to IPX-8 standards. One gasket is between the lower and upper pieces when screwing it closed, and the other is on the bottom of the Smart Piston Drive pill on/off switch. It prevents liquid from entering inside. Screwing on both top and bottom pieces is easy and does so quietly. Since this Nitecore D10sp R2 does not have a clicky switch like conventional flashlights, it operates a little differently in terms of feel because it has Nitecore's own Smart Piston Drive system which has the on/off switch on the bottom of the pill. The on/off button doesn't provide an audible click that you might be used too. It's almost like a silent keyboard key. The button doesn't have to travel far to execute the commands. It takes some getting used to when you experience it for the first time but easy to adapt to. This Nitecore D10sp R2 is a multi-mode flashlight meaning it has HIGH, MEDIUM, LOW and other functions such as strobe function, hidden SOS function, and safety lockout function. Executing the command to change between LOW, MED, HIGH is simple as holding the button for 0.5 seconds until the operation has changed. Once you begin to own flashlights, you will love having different modes, other than ON/OFF because it allows you more flexibility and saves you battery life in the process. On a single AA battery, the Nitecore D10sp R2 can last on HIGH for 60 minutes (depending on the capacity of your battery), MEDIUM for 6 hours, and 100 hours on LOW setting. From looking at the front of the flashlight and inside the reflector, I can already see that the Nitecore D10sp R2 is more of a flood light because the reflector has lots of orange peel effect. If the reflector contained a smooth reflector, it would have been a throw light (exactly like the Dorcy model I reviewed previously). Here is a list of possible functions with this flashlight. Light Activation: Put in one battery and screw back the light body tight, the light is turned on. Click the tail cap once, the light is turned off. Click the tail cap another time to turn on the light again. Brightness Choosing: When the light is ON, depress the tail cap and hold for more than 0.5 second, the brightness goes through Min, Mid and Max in cycles. When certain brightness is desired, release to stop brightness ramping and certain brightness level memorized. Hidden SOS and Strobe function: D10 SP and EX 10 SP have hidden SOS and Strobe function. When the light is ON, quick double-click the tail cap, the light enters SOS directly. hold, the light enters Strobe mode directly. Momentary On: Loosen the light bezel about one circle, the light enters momentary on mode. Under this mode, depress the tail cap to ON and release to OFF the light. second, the light will go to brightness choosing. Safety Lock-out: To avoid accidental activation, this light has safety lock-out function. When the light is turned off, depress the tail cap and hold for more than 1 second, the light will flash once to indicate that it has entered safety lock-out mode. Under this mode, the light will not turn on even if you depress the tail cap, which can avoid accidental activation. Under the safety lock-out mode, quick tripleclick the tail cap to withdraw. Not only will I share with you in words my personal experience with the Nitecore D10sp R2, I will seek to determine if the rated lumens is accurate by way of a digital LUX meter. Tests are completed with a fully charged battery in place. Results - How does it shine? This light really does a great job even with a single standard AA battery. The hotspot is bright and intense, and the spill light is extended making it very useful in real world situations because it illuminates a wide angle. It seems brighter than the specs say it is. I love it. The pictures in the gallery of the beam shots don't do the flashlight justice, it's much brighter than the pictures show, just use those as a guideline or example. This Nitecore produces without hesitation the smoothest and cleanest beam I've seen yet. There is no halo effect, no rings, nothing that is being abnormally seen from the LED. Excellent job. Under operation the flashlight has great heat dissipation as the whole body from top to bottom becomes warm, almost like a hand warmer at times. I measured the temperature of the front lens and it hovered around 36 degrees at one point. The included o-rings for future maintenance is a great addition and bundle to the package, other manufactures should take notice. I've used this flashlight daily for close to a year now and even though the exterior is a bit scuffed, it still looks great and the paint quality has held up astoundingly well given how hard I used this light. Even the lettering remains intact despite oily fingers. About the only negatives I've had with this LED flashlight is that the metal pocket clip needed re-adjustment from coming loose, and the wrist strap started to tear apart slowly over time. I like the Nitecore D10sp R2 and you should consider it on your top-list of consideration.